The woman hears “something” outside the car. She turns the radio off. 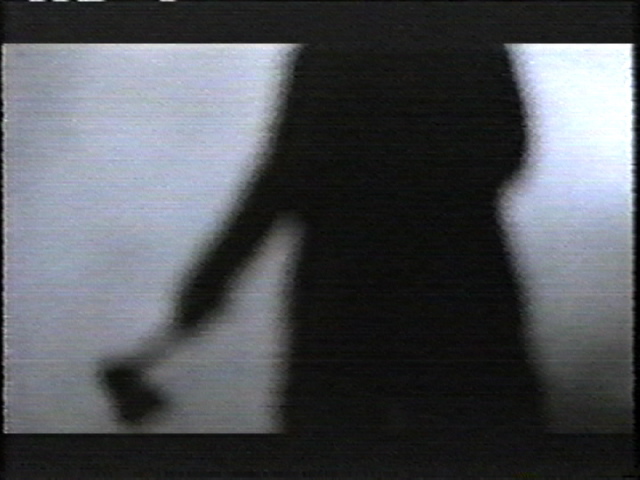 She sees the silhouette of a man, holding an ax, coming at them from the fog. 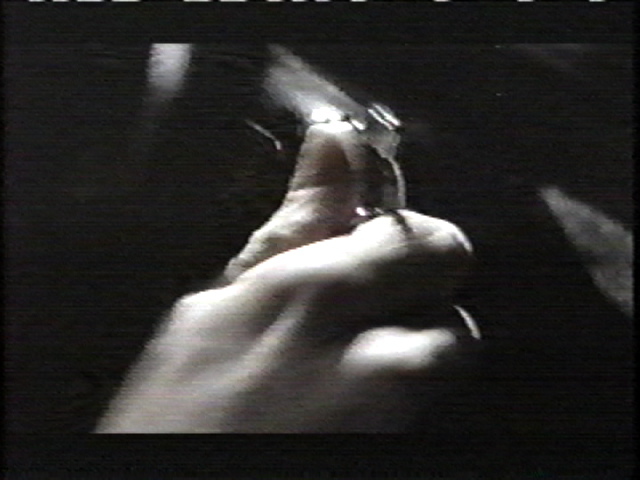 The camera then shows students the outline of a man brandishing an ax. Students know it is a weapon because everything says it is: The woman screaming, the use of scary music, the fog, and the portrayal of the mysterious figure all add up to a soon-to-be double murder. 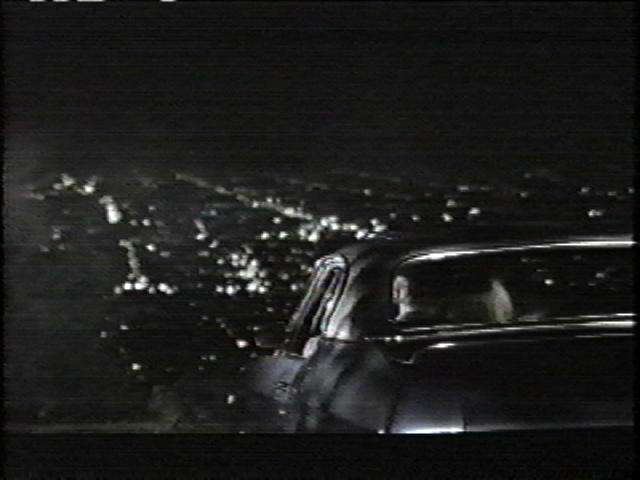 That was the effect the director of this spot wanted to create. He was very successful. Students are shaken as they see the utter terror on the face of the man and woman. The purpose of this film is to grab the audience’s attention with the threat of murder. Children may already be seeing in their mind’s eye the picture of blood all over the interior of the car. Will one them be butchered while the other is forced to watch? Will they be dragged out of their car and chopped to pieces in the woods? Preteens again see the man moving steadily to the car. All the young eyes are on the ax. Get the car started! The classroom audience is gripped with fear. Another camera shot of the ax. The “Man” keeps coming. 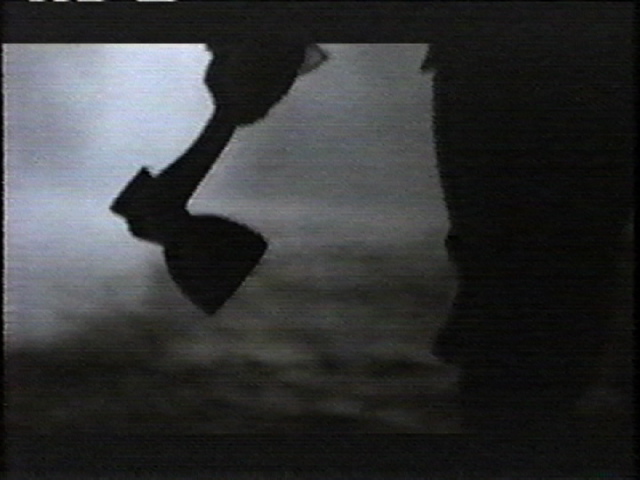 The ax or hatchet blade is the “star” of this film. It will take its toll on these two young people. They shouldn’t have been parking in a secluded area anyhow. This is a take-off on a whole genre of R-rated movies like Scream and I Know What You Did Last Summer. Channel One execs like president Judy Harris may think all preteens have watched R-rated movies. They obviously think preteens can handle such threatening images. Channel One News has always played fast and loose with other people’s children. More close-ups of the terrified young lady. The terror among the 6th grade students watching this on Channel One News must be palpable. These images are powerful. These two people are in mortal danger. They are going to be killed. Actually they are going to be chopped up. Of course, they can’t get their car started which causes more terror among the classroom audience. The car just won’t start!! 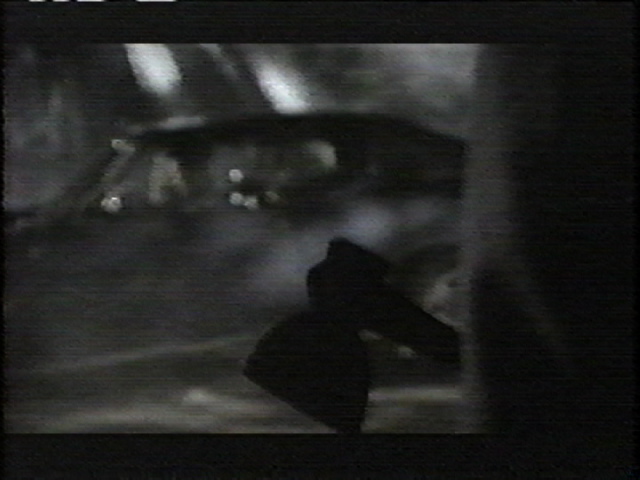 Above: The camera again shows the relentlessly advancing man. 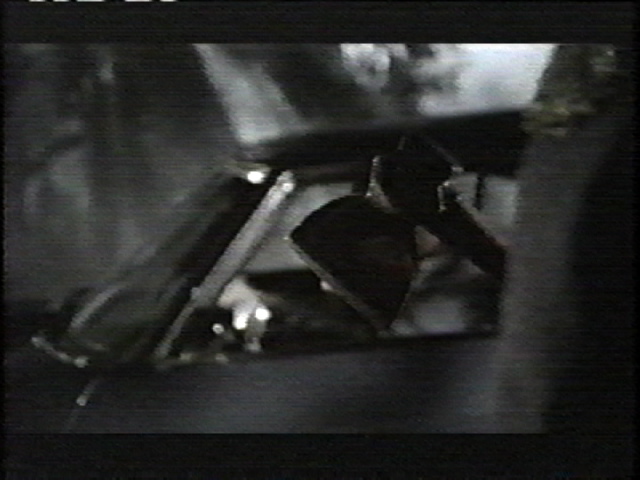 The mysterious man is almost off-camera but the blade is the focal point. Everything is done to maximize fear. The ax is raised and ready to strike. Below: The most terrifying part of this short film is when the young woman stops screaming and realizes the man with the ax is now at the window. “He’s at the window,” she whispers. The man hesitates to look. They both know they are dead. Below: Finally the the punch line to a very bad joke. Why it’s George Washington and his tree-chopping hatchet. 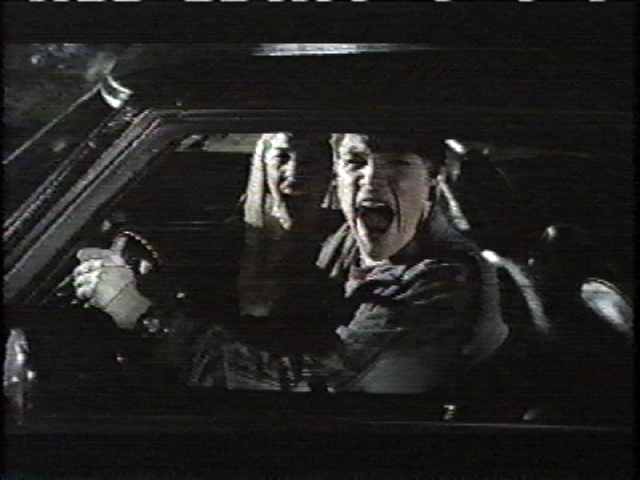 Above: The classroom is filled with the couple’s screams after they see Mr. Washington. Now, it is a suppose to be funny. See this “shocker” video for yourself. This is taken from the actual Channel One News broadcast the first week of September 2005. 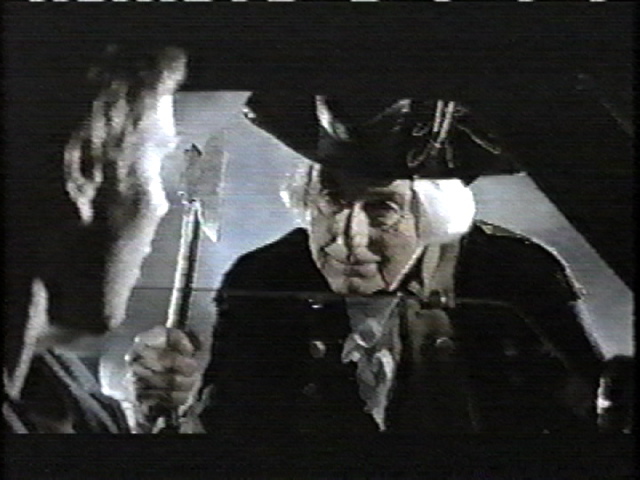 Question: Why is Mr. Washington holding the hatchet in a striking position? Do these two young people look like cherry trees? 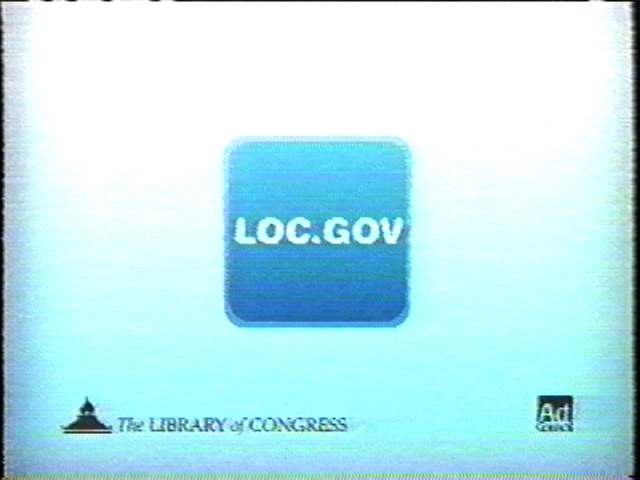 A spokesperson for the Library of Congress said that this PSA was not intended for the age range of Channel One’s audience. Channel One News doesn’t care what is appropriate or not. They want to collect the largest check they can from the LOC so 10-year-olds will continue to see the “Ax Murderer” spot. Are you ready to get Channel One out of your school? Teachers won’t take action. It has to be parents and other taxpayers who want this type of misuse of school time ended.